A narrow decision on charter school co-locations has charter proponents howling—but is their outrage overblown? Last week, the de Blasio administration declared war on charter schools, at least according to the New York Post. Governor Cuomo rushed to the barricades, telling a rally in Albany yesterday: “We are here today to tell you that we stand with you.… You are not alone. We will save charter schools.” Families for Excellent Schools, who organized the rally, claimed the Mayor's decision was met with universal opposition and characterized the move as the back end of a quid pro quo with the teachers union for endorsing the mayor. Wondering what actually happened? The de Blasio administration released a memo reviewing forty-nine co-location decisions made last fall by the lame-duck Bloomberg administration. A co-location is when two schools occupy the same building, and it’s been a controversial aspect of the charter-school movement. Many charters, which usually serve fewer special ed or bilingual students than regular public schools, get free rent on space in the regular public schools that charter advocates so often disdain–often space that the regular school needs..
De Blasio’s chancellor, Carmen Farina, set aside four of the decisions that won’t take effect until the 2015–16 school year to give more time for study. It ordered thirty-five of the forty-five remaining plans implemented. It called for one to be revised. And it cancelled nine planned co-locations. Six concerned regular public schools, which also often co-locate. Three were for charters. All three of those cancelled co-locations were for charters proposed by Eva Moskowitz’s Success Academy network. Her defenders see that as proof that the mayor, a long-time critic of Moskowitz, was singling her out. But given the aggressive expansion plans of the Success network, it’s not that surprising that she has a large presence on the list. Moskowitz will now need to find space for those students, including some already attending Success Academy’s Harlem 4, which had outgrown the two other co-located sites it was using. Given that Success Academy is rolling in money—Moskowitz reportedly pulls down $475,000, more than the president of the United States—it seems likely she’ll come up with something. Contrary to the shorthand way some have reported it, de Blasio didn’t rescind the schools’ charters—he couldn’t—he just said they can’t use public school space. Overall, fourteen charter-school co-locations—including five Success Academy ones—got the green light from Farina. Full disclosure: I’m a charter-school parent. My elder son attends a K-5 school in the Bronx that has its own building and, like many of New York City’s charter schools, has unionized. Despite misgivings about the charter movement, we sent him there because we hoped the school’s progressive philosophy would help him avoid the drudgery of test prep. When I’d toured a regular public school in my district to see if it was right for us, I’d seen a bulletin board of student essays… about their test prep. One kid said he visualized tackling the test and kicking its teeth out. This wasn’t what we were looking for. As it turns out, because our school performed poorly on its first round of standardized testing and had its charter threatened, test prep is now a pretty regular part of life there. But we still like it. My big take-away from five years as a charter-school daddy, however, is that there’s nothing magic about charter schools, which serve all of 6 percent of the city’s students. Some are good, and some aren’t. There is no “charter school model,” because charters embrace a wide spectrum of educational philosophies. If a charter has a commitment to serving a diverse population and not suspending every kid who doesn’t sit up straight, it’s likely going to struggle on the tests just like regular schools. And the replicability of successful charter-school teaching strategies in regular schools—which I always thought was one of the reasons to permit charter schools—is uncertain not just because of the curriculum rules and union contracts that regular schools must obey, but also because many leading charters have far more resources than the typical public school. 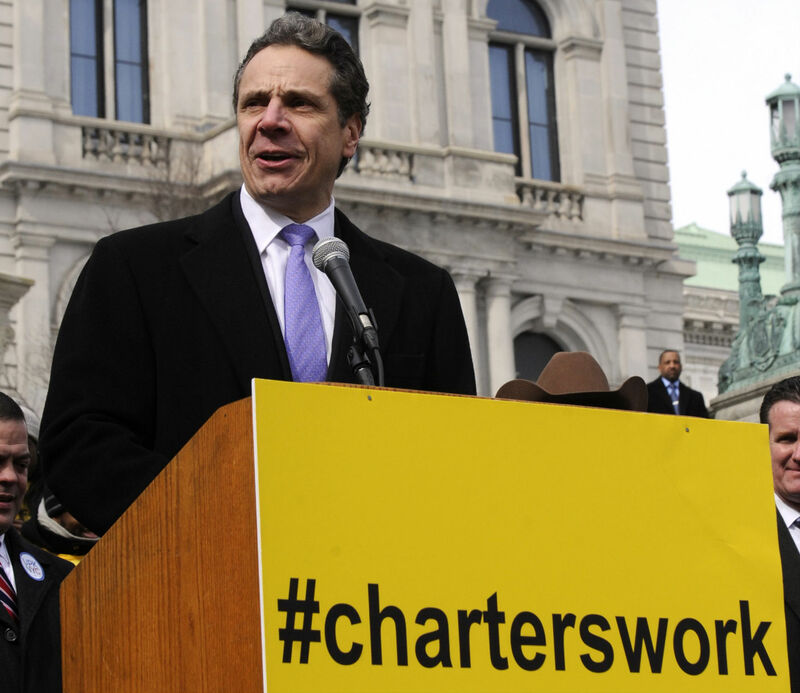 For my money, charters are neither a panacea nor a plague. But whatever they are, they aren’t so extraordinary that they deserve to take space away from regular public schools that need it. Hence the logic behind the decisions rendered by de Blasio’s DOE last week. Permitting fourteen charters to co-locate while blocking three doesn’t look much like a “war“ on charter schools. At worst, it’s a surgical strike. Perhaps the charter movement sees it as an opening salvo that it must resist or risk worse damage later. Or maybe it’s a convenient rationale to ask for state funding to cover the expense of classroom space, which they currently don’t receive; de Blasio has, after all, made clear that he is very unlikely to approve new co-locations in the future. And he did earlier in February cut $210 million in the budget for programs to help charter schools. But mostly it seems like everyone is just playing to the script. Charter-school advocates have been waiting for de Blasio to drop a daisy cutter on them. And they’re reacting as if he did, when in fact his administration rendered a pretty modest and narrow decision, especially given the sprawling ambition of the Bloomberg-authorized co-location wave it was reacting to. The de Blasio DOE’s touch was so light, in fact, that Council Speaker Melissa Mark-Viverito and Public Advocate Letitia James have said they’re going ahead with a lawsuit to challenge some of the co-locations the de Blasio administration approved. Unfortunately, that will just perpetuate this unproductive argument about charter schools. It’d be better to move on, treat charters as the minor part of the system they are, and figure out what to do for the 94 percent of public school kids who don’t attend charters. The lawsuit just gives the governor another opening to swoop in and “save” charter schools. Yawn.